Page Street Publishing, 9781624143175, 224pp. In Incredible Stories from Space, veteran space journalist Nancy Atkinson shares compelling insights from over 35 NASA scientists and engineers, taking readers behind the scenes of the unmanned missions that are transforming our understanding of the solar system and beyond. 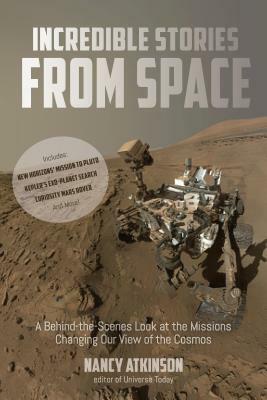 Weaving together one-on-one interviews along with the extraordinary sagas of the spacecraft themselves, this book chronicles the struggles and triumphs of nine current space missions and captures the true spirit of exploration and discovery. Full color images throughout reveal scientific discoveries and the stunning, breathtaking views of our universe, sent back to Earth by our robotic emissaries to the cosmos. Nancy Atkinson is an editor and writer for Universe Today, a popular space and astronomy news website. She is also a NASA/JPL Solar System Ambassador. She lives in Minnesota.